collaboration with various experts in their specific fields, institutions, artists and universities. international activities including: participation in international research and art projects, in organizing committees of international conferences and art events, editing an international publication, evaluator and opponent of PhD dissertations, research visits and positions abroad, invited keynote speaker abroad, an expert evaluator for research funding for European Commission, and for Austrian and Norwegian art & science funding bodies. 2002-06 she was Professor for media arts at the Art Academy in Oslo, Norway. 2007-11 she was awarded a five-year artist grant by the Finnish state. 2009-2010, 2011 she has been a visiting Professor at The University of Applied Arts in Vienna. 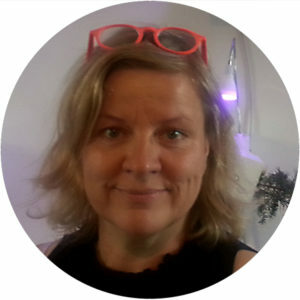 Since 2012 (-today) she is Associate Professor and the Head of PhD School at IT University in Copenhagen – where she is part of the REAL-research group.